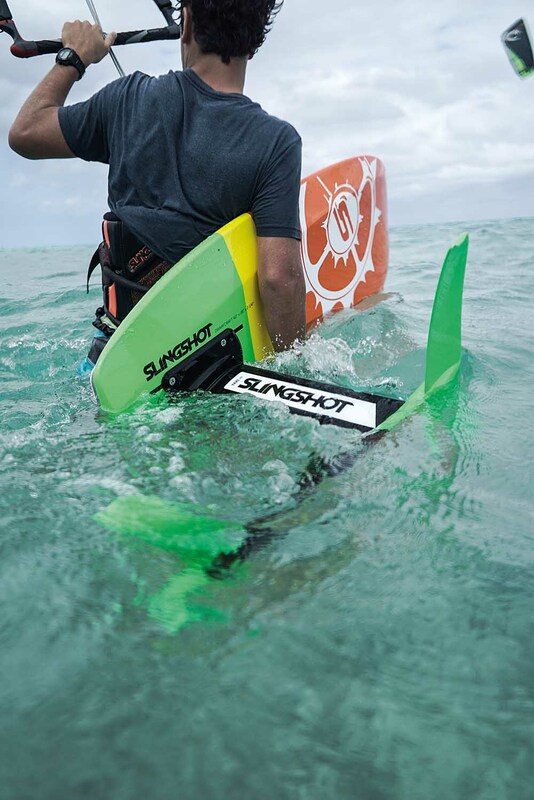 Alex Fox Talks about the new Slingshot kiteboards! So this year, after about five years of using a fast-track mounting system, we’re now back to inserts. We’ve switched now because we’ve made an innovation called Carbon Bedrock Inserts. It’s an insert embedded in some carbon and the carbon has a lot of flex to it, so when we put that insert pack in our board it’s not only super durable, but it also provides smooth consistent flex. It’s impossible to really pull these inserts out – they are very, very strong. We have increased strength and reduced weight, which is the Holy Grail. Sam Light’s new pro model is now available in a 135, 139, or 143 Refraction. We also gave Karolina her own pro model board – the 135 Karolina pro. 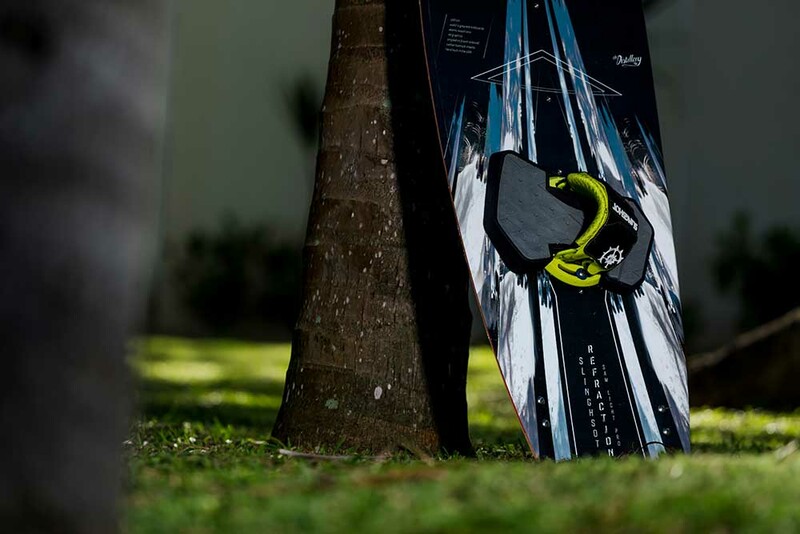 Same outline and construction as Sam’s board with a more performance lightweight base. 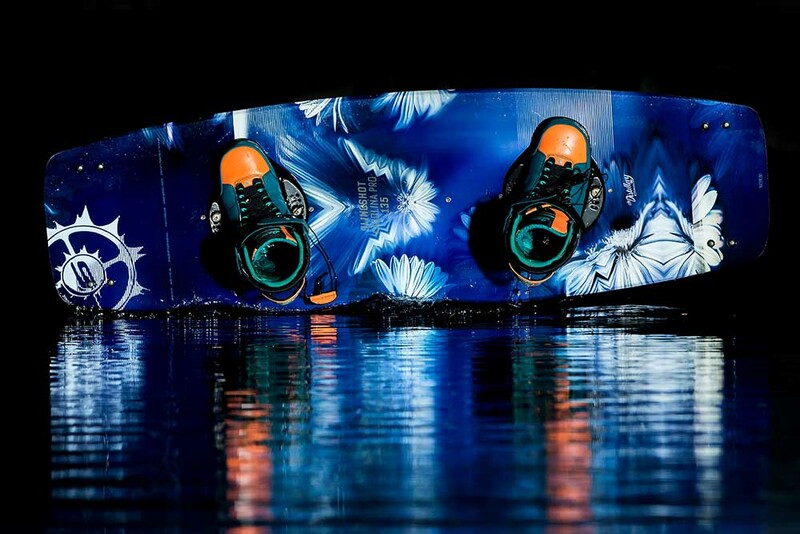 Sam’s has a 7mm wakeboard base. It’s called the ballistic base, it’s very durable. He’s had them for about four months and he still hasn’t even worn through his first one. It’s the ultimate crossover cable board. Karolina’s board is tailored to her. It’s a 135 for the girls – cool, fun, sporty graphic, and really lightweight base, same carbon bedrock insert so her board is lighter than last year’s version. All of our boards are lighter, they’re probably the lightest full wood core boards on the market. Really exciting. Tell us about the new light wind beast the Turbine? The elements that made the Turbine so efficient for light wind in the 15 and the 17 – fast and able to track upwind really well – we used all that DNA and experience and did a full-sized range. So now we have 5, 7, 9, 11, 13, to complement the already existing 15- and 17-metre Turbine. Then we went in and tailored each size and checked it off and made tweaks that were specific to each size. So you have this high boosting freestyle animal. It’s really fast through the window, tracks up wind really well, boosts great and has tons of hang time. That’s gonna be our new really high-performance kite for the guy who wants ultimate performance out of big-boosting, upwind tacking. It kind of sits a little bit ahead of the Rally as far as a performance kite in that sort of swept wingtip class. It’s a Rally on steroids, like full richter! Can’t wait to have a go at one. Yeah, me too. I’ve been riding them a little bit, just the prototypes, but it’ll be good to actually get on them and spend some time with them. And Ride Engine have updated their harnesses? Yeah one of the most exciting things I’ve been able to work on for us has been the Ride Engine harnesses. Such a new kind of marquee product for us. Last year when we were at the showings we were greeted with a lot of doubt, maybe not from you because you’ve seen all the other guys that have been wearing them, but the industry was kind of weirded out by it. It’s such a different thing to see a harness with a hard shell, but I think after this year, coming back now, all the dealers that were the most skeptical were the most adamant about them. They love them. And now you have all these other brands that are kind of scrambling to come to market with a full hard shell harness. I think we’re the leaders in the market because we’ve been doing it the longest. We consolidated online this year. We had three models last year and now we have two models in. One of the models is the elite series, it’s premium composite so you have black carbon, carbon, and then a bamboo construction. There are three different models in that segment. And then we also have the hex core. You have five different colours in the hex core. Basically, just updated construction, a little bit more ergonomic fit, and where we were getting some wear and tear, we added some reinforcements, a better closure system. A lot of new changes that are just better for the consumer. We took a lot of the feedback from our team. Our team’s growing now, we’ve added Andre Phillip, we have Jesse now, we’ve got Sam Light. We have just a lot of people and we’re excited to get their feedback because now they’ve been on the harnesses for a whole year and we were able to use all that to our advantage. Anything that we really thought needed to be changed, we changed. There are a bunch of new spreader bars as well? Yeah, a bunch of new spreader bars now, a lot more updated looks, just to clean up how the front of the harness sits and works. We also are offering a bunch of new sizes, so we have, 6, 8, 10, and 12-inch spreader bars, and we are now offering an extra small, small, medium, large, extra large, and double extra large. We have a full size range from tiny women and kids to big fat boys, so it’s gonna be awesome. We came to market with this Hover Glide product. It’s such a great entry level price point foil, but it just has so much performance packed into it. It really makes foiling accessible to everybody. It’s less intimidating when you look at the price tag, it’s also less intimidating with our new Learn to Fly Mast program. We have a 15-inch mast, a 24-inch mast, a 30-inch mast, and those segmented masts make it easier for you to learn how to foil. So it’s not only easier, it’s also safer. When you are using a 15-inch mast it’s harder for the foil to come back and hit you, it’s also easier when you start getting your first rides up out of the water, as you can only go 15 inches up out of the water. When you do inevitably come back down because you’re not a proficient foiler, you just land right back on the board and you have the ability to keep going. You might be able to borrow the different length masts from your local store? What would be a great thing is if you were to purchase a hover glide, the dealer would lend you the three masts and then you’d ride them and work your way up to the 35.5 inch mast – which comes standard on the hover glide – and then give the mast package back to the dealer. 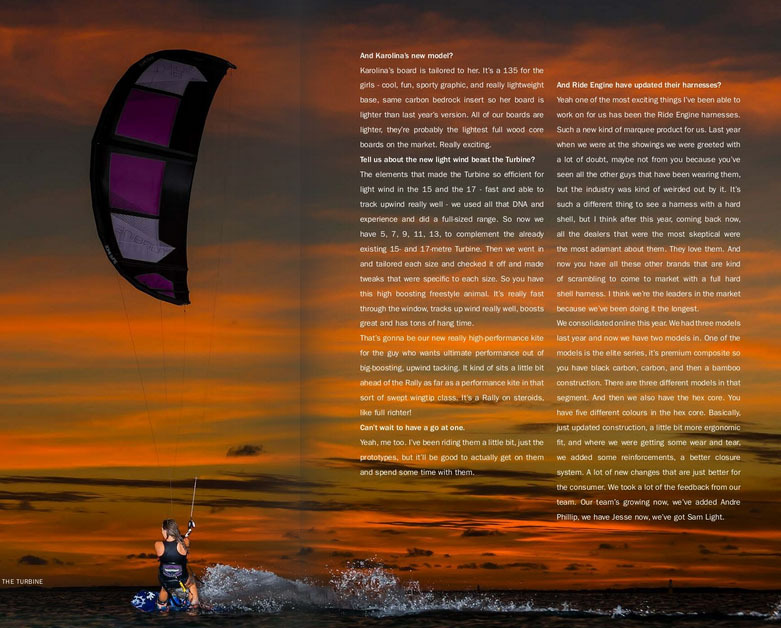 So then you’ve learned how to foil and you didn’t spend any money buying the masts, the retailer does it all. That’s not locked in yet? I think it’s pretty much set, it’s such an easy thing to implement. That mast package costs $269 retail, it’s dirt cheap. I was even explaining to my friends, I was like, “Dude you should just buy a hover glide and buy the mast package and then just teach all your friends”. 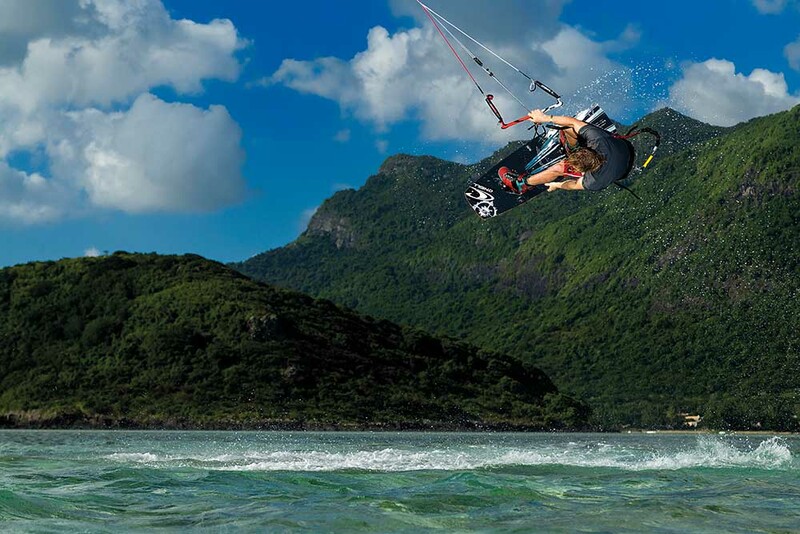 If you’re the first foiler in your group, then you’re going to be foiling by yourself. 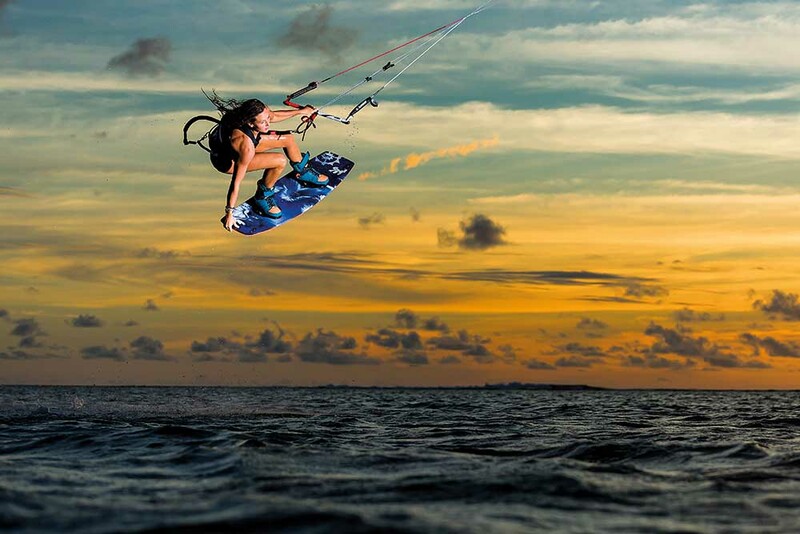 When it’s light wind, nobody else is going to be out there with you, because you can ride but nobody else can. So you’re looking around and you’re like, “Damn, this isn’t fun, I don’t have any of my friends out here”. You might as well bite the bullet and spend the extra $260 and make your mates pay you like, 20 bucks every time they use it lol. Or at least a free hot dog, right? Yeah, a free hot dog, a couple beers maybe? It’s just one of those things, man. There are a lot of entry level foils, but this one is so amazing. We have a bunch of carbon foils, and I choose to use the hover glide because I just think it’s the best foil. It’s super stable, it’s really fun to rock around on. It doesn’t ever feel like it’s dragging. It’s a really great product. Our designer did a fantastic job.